Crystal wands Handcrafted by Remnants of Magic are all one of a kind and can not be mass produced or copied. The craftsmanship and time that goes in to each wand can not be matched. 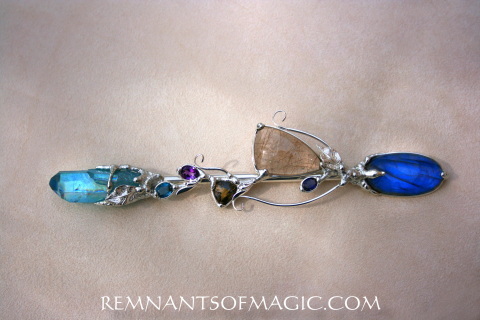 Each wand is a one of a kind magical treasure. Crystal wands have powerful energy as they are made up of pure crystals and gemstones from top to bottom, and are mainly used for healing, clearing spaces, and meditation. They vary in length, weight, size and shape - no two will ever be the same. A crystal wand is not just a tool but is also a deeply personal object and people are often drawn to a wand that is in some ways 'right' for them. 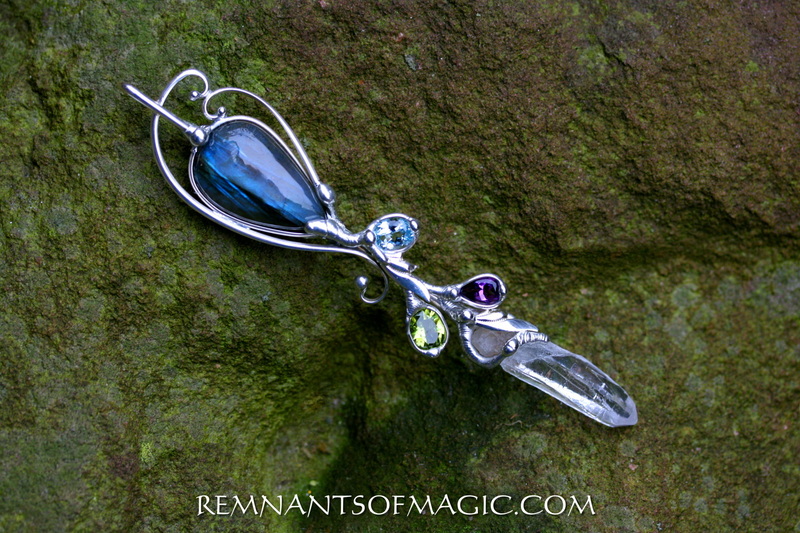 Crystal wands gather and direct energy. 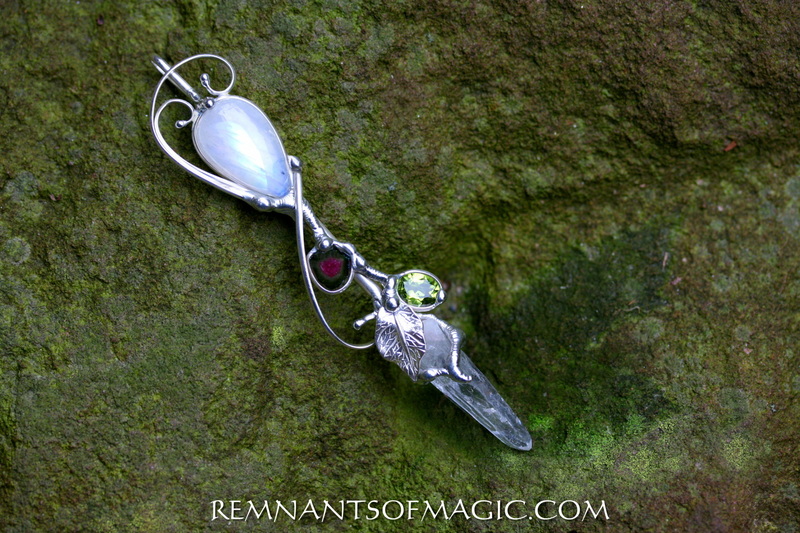 The elongated, cylindrical shape of a wand enables the stone or crystal to direct its healing energy in a straight line, and the wand's point focuses the crystal's energy so that it can be used on specific areas of the body. These wands are beautiful tools to place your intent for transformation, healing, love, prosperity, courage, peace, joy, well-being and balance in your life. An amazing healing crystal, Lemurian Quartz will assist in removing all types of energy blockages. Use a Lemurian Quartz Crystal forhealing and meditation work. Also called “Lemurian Seed Crystals” or "Lemurian Star Seeds", Lemurian Quartz Crystals were originally found in Brazil. Amethyst is a stone of spiritual protection and purification, cleansing one's energy field of negative influences and attachments, and creating a resonant shield of spiritual Light around the body. It acts as a barrier against lower energies, psychic attack, stress and unhealthy environments. Rainbow Moonstone is a gemstone that has a meaning and properties of enhancing mental power. This gemstone is a symbol of “The Goddess of Moon.” Feminine and gentle energy is condensed in it. It will be useful when you need to have strong mind and control your feeling. Watermelon Tourmaline is a combination of pink and greenTourmaline that soothes the heart and counters anger or resentment. Used in meditation it assists with calming the mind and the emotions, allowing us to release stress. Vera Cruz Amethyst is an excellent meditation and scrying aide which activates the crown chakra. Vera Cruz Amethyst is the crystal of spirituality and contentment, assisting one to connect with pure peace humanities natural state of existence. Vera Cruz Amethyst opens intuition and spiritual wisdom. London Blue Topaz has a meaning of settling your mind. Its deep blue is famous for an effect of calming down. It is useful when you want to control your feelings well or heal your hurt feelings. Not only for healing, London Blue Topazcan strengthen your heart. Smoky Quartz is one of the most efficient crystals for grounding and cleansing. 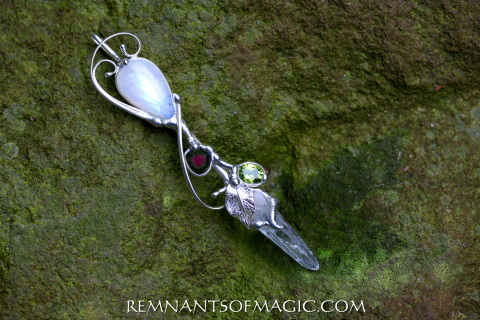 Alone, or naturally blended with other Quartz, it provides some of the finest healing tools available. Some varieties include: ... This stone amplifies and directs sound healing, creating a two-way flow of energy. Golden Labradorite is a stone of confidence, courage and vitality. Golden Labradorite clears, balances and aligns the energies of the subtle body. Golden Labradorite stimulates clarity of thought and focus. Golden Labradorite is a spiritual teacher when used in meditation. Labradorite is For self-discovery, it is excellent for awakening one's own awareness of inner spirit, intuition and psychic abilities. Labradorite is also the most powerful protector of the mineral kingdom, creating a shielding force throughout the aura and strengthening natural energies from within. This wand is 8 inches. 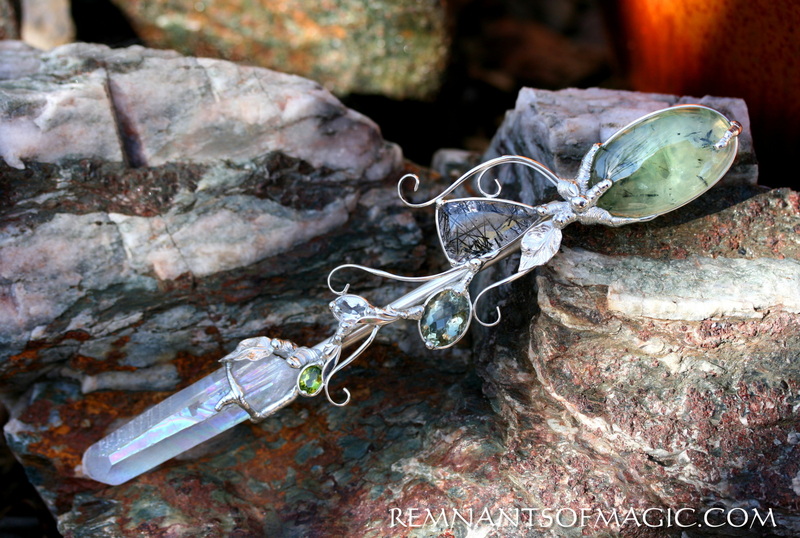 This stunning wand is adored with Angel Aura Quartz, peridot, white topaz, green amethyst, tourmilated quartz and prehnite at the end. Handcrafted out of sterling silver and the only one in existence. This stunning wand is adored with Angel Aura Quartz, facted Phenacite, Herkimer diamonds, Rainbow moonstones and a Manifestation Quartz crystal in the end. Handcrafted out of sterling silver and the only one in existence. 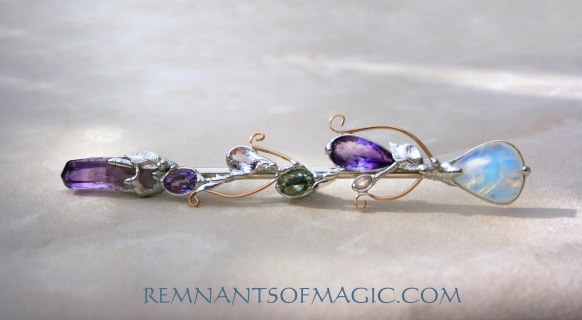 This Magical wand is stunning adorned with Amethyst, Kunzite, Green Amethyst, Super Seven, Morganite and Rainbow moonstone​. All handcrafted in sterling silver and gold. 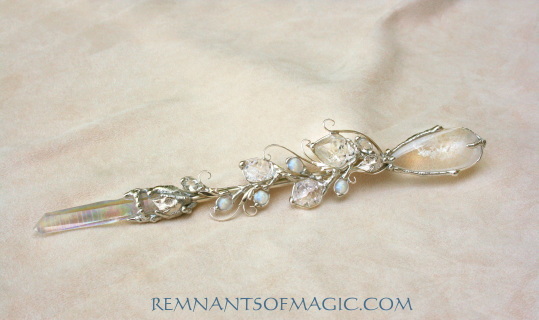 This magical wand is one of a kind and has a very nice healing energy radiating from it. This wand is 8 inches in length. 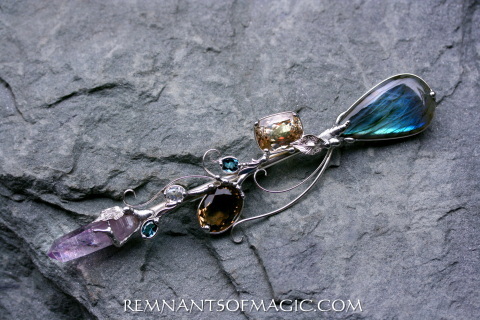 This Magical wand is stunning adorned with Aqua Aura quartz, London blue topaz, amethyst, smoky quartz, rutilated quartz, iolite, and labradorite​. All handcrafted in sterling silver. 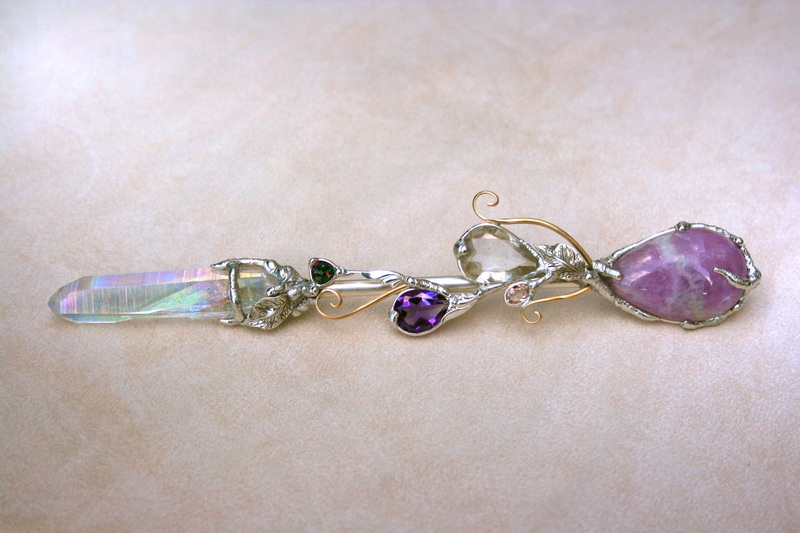 This magical wand is one of a kind and has a very nice healing energy radiating from it. This wand is 8 inches in length. This Magical wand is stunning adorned with Angel Aura quartz,Mystic Topaz, Amethyst, Morganite, Rutilated Quartz and Pink Kunzite. All handcrafted in sterling silver and gold. 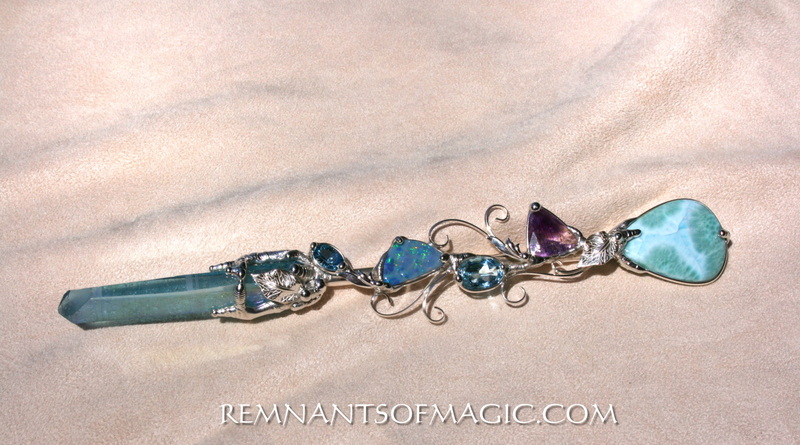 This magical wand is one of a kind and has a very nice healing energy radiating from it. This wand is 8 inches in length. Angel Aura Quartz is quartz that is permanently treated by fusing platinum with heat and vacuum to give it its gorgeous angelic coloring. Mystical lore counts it a stone of high spiritual energy. It is said that it is very helpful to the aura which it can protect, balance, and bring energetic health. Mystic Topaz is said to promote the successful completion of endeavors; it also improves relationships through better quality and clarity of communication and understanding. Insight gained through the influence of topaz encourages clarity and a deeper understanding of ones self and the areas around personal expansion and growth. Rutilated Quartz Promotes a connection with the Divine. It is a self-contained example of two very synergistic minerals working in combination with each other, where each mineral enhances the energies of the other. Many crystal lovers utilize the energies for channeling and astral travel. It is also used to enhance psychic abilities, clairvoyance, and telepathy. Morganite ​Is known both as an angel stone and a heart stone. It can bring love to one's life or rekindle old love. As an angel stone, it is known to help with communicating with angels. Morganite also brings compassion, empathy, self-control, and patience. It can also balance emotions and ease the pain of separation. Kunzite is said to help one to understand and interact better with others, to help heal "broken hearts", to relieve stress and anger, and to bring love, peace and harmony. It is also a stone that is used in metaphysics to removes obstacles.